UV Lighting for Reptiles: A new problem with high UVB output fluorescent compact lamps and tubes? "Help! I think my reptile has this problem, what shall I do?" "How should I respond to this report?" Please note: This report was written in the second half of 2007, with updates made regularly until April 2008. We continue to hear of very small numbers of cases but fortunately, owing to the positive efforts of most of the companies whose products were involved, lamps causing these problems are being steadily replaced by re-formulated products which don't emit abnormally short-wavelength UVB radiation. (See later for an explanation of this.) However there are still small numbers of "old stock" of certain products on sale in some areas, and there is always the possibility that a new untested product may be introduced and found to cause problems. This section of the website will shortly be revised to bring it fully up to date; but this report is still valid today - September 2009. Most of the affected reptiles recovered within 2 – 14 days once the lamps were removed, but we have now heard of five animals - three chameleons and two hatchling bearded dragons - which died before the cause of the problem was recognised. One of the chameleons which died also suffered severe skin damage, also believed to be caused by the lamp. In previous years, we have heard of a few isolated cases; usually these have been following the positioning of an especially high-UVB lamp (such as certain types of mercury vapour lamp) particularly close to a species that does not normally bask in sunlight. However, there seems to have been a sudden increase in the number of cases reported, over the last 12 months, almost entirely associated with the use of specific brands of new “high output” UVB fluorescent lamps. 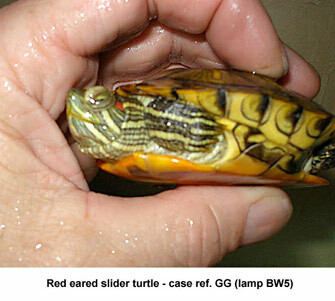 Moreover, species which are known to bask in full sunlight, such as bearded dragons and red-eared-slider turtles, have been affected. 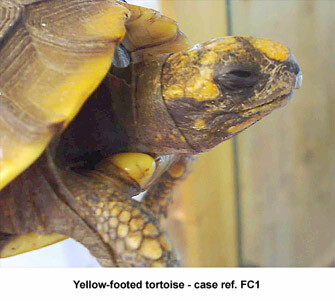 Photographs of some of the affected animals (from our case studies) are shown in figs. 1-4. The painful condition leads to a refusal to open the eyes, and in some cases, very swollen eyelids. We began a serious investigation of these reports in April 2007 following an alert from one of the organisers of a popular hobbyists’ website forum in the USA, www.redearslider.com, where members had become very concerned following a spate of problems in turtles across the USA. We have now documented 40 individual cases, occurring since September 2006, affecting 16 turtles, 3 tortoises and 21 lizards in the USA and in Europe, affected by ZooMed Reptisun 10.0 Compact Lamps and (more rarely) 5.0 Compact Lamps. We are aware of one incident reported previously, associated with a Big Apple Herpetological Mystic Lamp. At the beginning of September 2007, we first become aware of reptiles being affected by excessive UVB radiation from lamps from the R-Zilla Desert 50 series lamps; we now know of five incidents involving at least another 40 animals (one case involves a large number of bearded dragons owned by a breeder). We have therefore thoroughly tested samples of the new-style ZooMed Reptisun compact lamps and Big Apple Herpetological Mystic lamps, and two lamps from the new R-Zilla Desert 50 Series. We have compared their output with similar UVB fluorescent lamps and tubes of other brands which, as far as we are aware, have not caused this problem. The full reports on the lamps we have tested have now been completed. The case histories relevant to the ZooMed compact lamps are complete; we are still gathering data regarding the cases relevant to the R-Zilla lamps. Each company has been sent a very detailed report with all the lamp test results and case histories relating to their products. We earnestly hope and believe that all will respond swiftly and positively to our discoveries. We have already received encouraging responses, as each company begins to address the problem, and we will be publishing their information as soon as we receive it. The report on the ZooMed lamps was co-authored by Frances Baines in the UK (FB) and exotic specialist veterinary surgeon Michele Buono in Italy (MB), who has contributed a number of case reports. The reports on the R-Zilla and Big Apple Herpetological lamps are by Frances Baines. What is published here on UVGuideUK is a condensed report, combining the highlights of all the work done so far on all three brands. Unfortunately, the very nature of this work means that it is going to be "heavy reading", but the reason for the problem is not obvious - which is presumably why it has occurred in the first place. Case histories. We have summarised all the information we have received to date, in table form. We have also been able to write much more detailed case histories for twelve incidents involving use of a Reptisun 10.0 Compact Lamp (seven personally examined by MB and five reported in detail by the owners themselves, to FB) and one involving the use of a R-Zilla Desert 50 series T8 linear tube, also reported to FB by the owner. We are publishing these in full, here on UV Guide UK. Lamp test results. The full test results are not published here in full, because of the large amount of material. (The report to ZooMed, for example, is 60 pages long.) We have summarised the results, using graphs and charts wherever possible. This covers all the essential details. To read these highlights, click here. Discussion about the "phototherapy" phosphor we have found in the lamps which have caused problems. 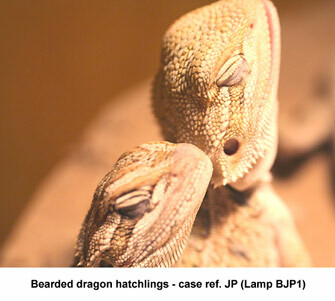 Read here why we are concerned that its inclusion in reptile lamps may be of concern. The production of non-solar UVB and high levels of low-wavelength solar UVB by the "phototherapy" phosphor used in these lamps may be a cause for particular concern. 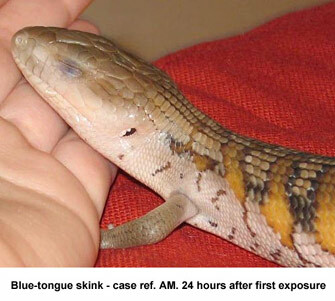 Further studies are needed to ascertain whether long-term exposure to these wavelengths, at any intensity, is in any way detrimental to reptile health. Until such studies have been carried out, and the risks to reptile health properly assessed, we recommend that alternative phosphors be used in these lamps. We are very pleased to be in contact with the companies selling the lamps featured in this report. As they keep us informed of their progress in addressing these issues, we will keep you informed by publishing their responses in this section. References. Throughout these pages, we have provided links to a detailed reference list of scientific papers and other relevant material.